Among the 7 “higher” plants found in the Rhynie chert, Asteroxylon is the tallest and most advanced one. According to detailed reconstructions pictured in palaeobotany monographs and on websites, with broad sporangia laterally attached to the upright axis by means of a short stalk, it conspicuously resembles some recent clubmoss (Fig.1). Fig.1: Reconstruction of Asteroxylon as usually pictured: drawing in  after a wax model by Bhutta , apparently embellished to resemble a recent clubmoss. Fig.2, far right: Longitudinal section of Asteroxylon with two sporangia cut lengthwise, drawn after photograph in . While the sporangia of Aglaophyton and Horneophyton are not rare and easily recognized in the chert, those of Asteroxylon are rather elusive. A photograph by Lyon  is possibly the only picture clearly showing both the lateral attachment and longitudinal section (Fig.2). Chert samples containing Asteroxylon with sporangia like those collected by Lyon and provided to Bhutta  for study are rare. Doubts concerning the reconstruction in Fig.1 arise from its tortuous way of making: According to  it has been drawn after a wax model kept at the National Museum of Scotland, Edinburgh. The wax model had been crafted by Bhutta after a series of images of peels as an essential part of his thesis , where it is reproduced in several photographs which do not as much resemble a recent clubmoss as Fig.1 does. Thus it appears that Fig.1 is an idealized reconstruction adapted to a recent clubmoss. According to , the sporangia are “somewhat reniform" and "may show varying degrees of distortion", which indicates greater variability than suggested by Fig.1. Own examinations have produced several small round sections of sporangia near Asteroxylon axes on cut faces of chert samples but no broad sections which should be expected from sporangia shaped as those in Fig.1. 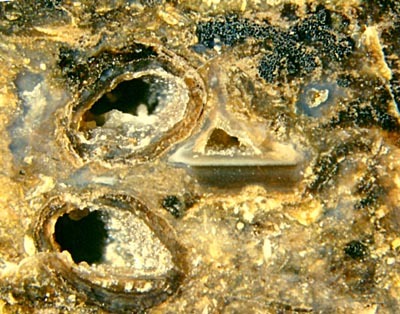 The interpretation of sporangia found quite close to Asteroxylon xylem as in Fig.3 is not easy because what is seen close together in the chert does not necessarily belong together. Asteroxylon is often found next to the smaller plant Nothia in the same sample, and sections of Nothia sporangia resemble those in Fig.3. Until Nothia had been recognized by Lyon as another species in 1964 , it was mistaken for Asteroxylon branches. Since the two species are most often preserved in a damaged state, with the more durable xylem strands and capsules displaced, uncertainty and confusion seem inevitable. Fig.3: Sections of two sporangia, or two lobes of one, partially filled with quartz crystals, only a few spores left. Note the Asteroxylon xylem cross-section above right, also the level band indicating a prostrate position of the axis during silicification. Width of the picture 5mm. Differences in other anatomical detail have raised the question of the possible presence of more than one Asteroxylon species in the Rhynie chert , which might (partially) explain the apparent variability of sporangia. With such state of things it is worth while looking for evidence incompatible with Fig.1, thereby being cautious not to mistake the possibly also present sporangia of Nothia for those of Asteroxylon as it had been done before. The mutual arrangement of the two sections in Fig.3 does not look incidental. The cavities seem to extend into and possibly converge in the depth. If so, they would belong to a sporangium whose lumen is broad below but divided into two tapered lobes above. An interpretation of Fig.3 as a two-lobed Asteroxylon sporangium would obviously be incompatible with Fig.1. It has been the aim of this contribution to draw the attention to the question of how much Asteroxylon can deviate from its current reconstruction. W.N. Stewart, G.W. Rothwell: Paleobotany and the Evolution of Plants, Cambridge 1993. A.A. Bhutta: Studies on the Flora of the Rhynie chert, Ph.D. thesis, University of Wales, Cardiff, 1969. A.G. Lyon: Probable fertile region of Asteroxylon mackiei, Nature 203(1964), 1082-83. W. Remy, H. Hass: Langiophyton mackiei, ... . Addendum. Argumenta Palaeobot. 8(1991), 69-117.